I just left Minnesota (was there for a week for a work trip) - lovely place! enjoy! you look so good there surrounded by all of your creative spiffiness! Right at home...and all of the attentions showered upon you were well deserved! you work so diligently...so hard...and should be recognized for all of your creative efforts. the world is so much prettier and ever the more so interesting with your presence! I've put your bloggy link on my blog reading list along my other favourite daily reads, just thought you might like to know that! YAY! So glad you had a lovely time! You are beyond adorable. I love your hair and your dress. I'm glad you guys had so much fun! Tif, it looks absolutely brilliant! Thankyou so much for sharing all those photos with us! It looks like a splendid time was had by all.. Your notepads in that handy dandy suitcase! Oh, don't you look positively radiant! So glad you had a great time. Your booth is to die for. Looks like you had a great time there!...your stand looks delicious full of sweet things...oh, why are those nice things always that far away from that tiny country i live in? So glad you had a great time, it looked such a spiffingly wonderful occasion. What a happy Tif, your smile could go round the world and back again. 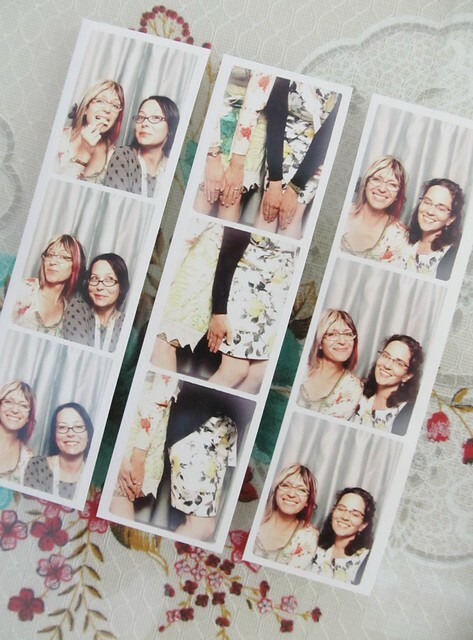 Those photo booth shots are classic! you my darlin are just special. i am loving your book, witty and wonderful just as i imagined. truly a vacation to my soul to meet you and chat. happy clog riding high. you must have a celebrate of you. yippee!! It was such a pleasure to meet you. I couldn't put your book down yesterday afternoon and read it in one sitting. You if I was creative when you signed my book. I said, "In my mind." I have a dream and The Dancing B*a*g Lady will key to making it happen. I will continue to follow. Inspired. Charmed. Enchanted. Much love to you for being you. 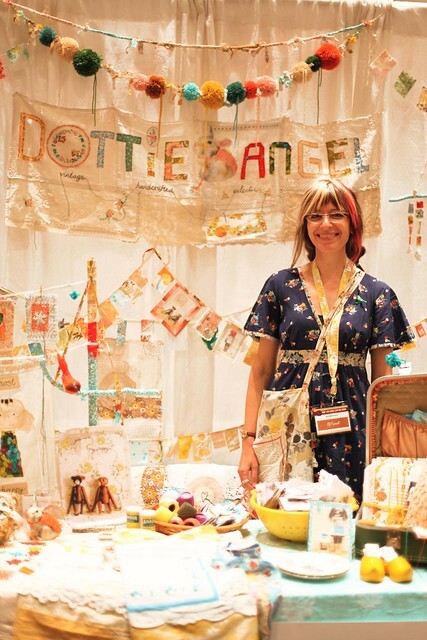 I can't wait to purchase a handmade item and any product you and Debbie present to the world. Ooo, Tif, I love your hair! Oh Tif I'm GLAD you had a WONDERFUL time....I ONLY wish I could have gone myself....!! Wow...I just checked out the slide show and I wish I could have been there! Loving the hair colours - wish i could be this adventurous but it's the whole bleach/dye thing i'm afraid. Nearest i'll get is clip-in tresses. My friend Marsha went to the show and was telling me how much I would love you and your booth-I told her how I love your blog and read it all the time!-she said, NO way!! !-she is the one who bought your little knitted gnome. I was so thrilled!especially to know that they only thing I sold, I sold it to you!!-hah!!! how funny! Welcome back, nice to hear from you again, and hope to hear more. Am just too far, wish to be able to say "Hello Tif"
handwork mama! yes i LOVE my little pesky knitted gnome. he is happily hanging below a little framed picture in our hallway. he just spoke to me the moment i spied him, would have loved to meet you! dancing b*a*g lady... i remember and yes you are creative! funny how i asked you that question isn't it, like it was meant to be, so happy you love the book and good luck with your creativity my dear! creative carmelina, many thank yous indeed! It was so nice getting to meet you in person and getting to chat for a bit! !